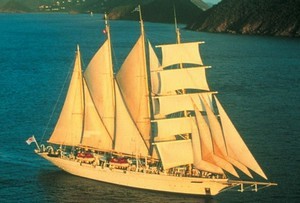 Star Clippers owns three sailing ships, which are Royal Clipper, Star Flyer, Star Clipper. They are suitable for travellers who want to have a voyage to the exotic islands on vessels other than normal cruise ships. Royal Clipper is also the largest square-rigged ship in service. The three sailing ships sail to the Caribbean, the Mediterranean, French Polynesia, Far East and Indian Ocean.